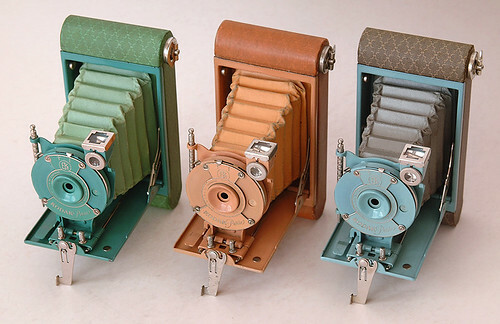 The Kodak Petite is basically a colored Vest Pocket Kodak Model B camera and was made from 1929 to 1934. It came in five colors: blue, green, grey, lavender and old rose, with matching colored bellows. 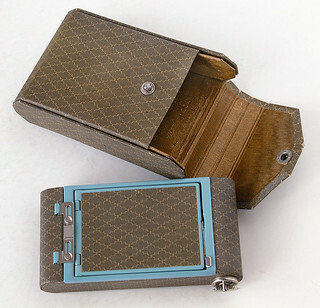 The body covering has diamond patterning and it came with a matching case. It has the Autographic back with a stylus on the front lens mount. Film size 127. ↑ Coe, Brian: Kodak Cameras, the First Hundred Years; Hove Foto Books, Hove, UK. 1988; ISBN 0-906447-44-5, or 2nd edition, 2003; ISBN 1874707375. p.131. This page was last edited on 4 November 2018, at 11:18.